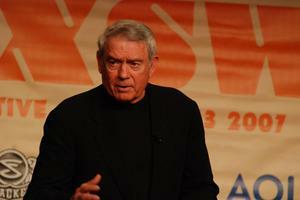 Jane Hamsher of firedoglake.com is interviewing Dan Rather at the SXSW XXI keynote interview. I came only 20 minutes early, but am sitting in the fifth row, center, of a huge ballroom - which is, however, rapidly filling in behind and around me. I'm one of 456784 people with a laptop, so I may not so much liveblog this as just make some notes for later. We'll see. Jane Hamsher introduces him. Says he is a reporter who has never been intimidated by the politics of access. Willingness to ask the second question, an inspiration. She says nobody is putting hard questions to GWB and Cheney like Dan Rather did to Richard Nixon. 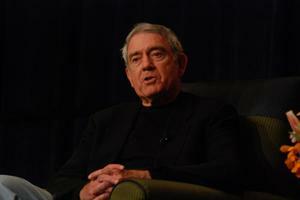 "We need Dan Rather right now." Rather comes out and gets a STANDING OVATION. "Never take time to deny it, the audience will find out the truth soon enough." Abe Lincoln on overly generous introductions. All the rest and lots more photos after the jump. 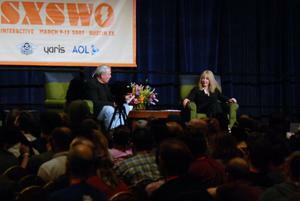 UPDATE: SXSW has posted the podcast here. Q: What was it like when Richard Nixon dismissed you and you refused to be dismissed? A: I will answer the question, but first - we're in a very serious time. In the forefront of my mind is that the way we call attention to the problems is important, but so many of our very best men and women are committed to danger in far away places. Now, the Nixon period might strike many here as being as far away as Ceasar's campaigns... I was really proud to go up through the gates of the White House every morning... I made a lot of mistakes and I regret every one of them... but I saw my role as to be an honest broker of information, a surrogate for people who were out working that day... I never saw myself as "challenging" President Nixon, but to do my job to ... find out what was going on as opposed to what the President and those around him wanted us to believe was going on. What he was saying was all the time not just being put in doubt but being disproved.... what I tried to do with Richard Nixon... was pose questions that would say, Mr. President, you're saying one thing, the evidence is overwhelmingly building that what you're saying isn't true. What say you? Says Nixon would try to throw the reporter off balance, or if that didn't work, try to duck the question. But Rather always asked on the basis of the facts. As it turns out, the President of the US was one of the leaders of a widespread criminal conspiracy... those were the facts.... the President of the US was not just a part of it, he was a leader of it.... what I did was try to point out that the facts were the facts, and what the president was saying increasingly was something other than the facts. Q: She asked if journalists have this opportunity today? A: Says he includes himself in criticism. Says American journalism has lost its guts. Says there are notable exceptions, but most journalists "go along to get along." Access journalism. You trade for access. The danger is real and present of being accused of being anti-patriotic or not supporting the troops. "The humiliation of journalists." We brought it on ourselves. We've lost the sense of the patriotic journalist, who should be on his or her feet asking the tough questions, following up with the tough questions. To question power. To keep on asking tough questions. Follow up on them. Follow up on OTHER reporters' tough questions. Q: Small coterie of Beltway journalists. A: This is part and parcel of what has happened to American journalism. What we need is a spine transplant. Says it was like this in the 30s, too. In recent years, the nexus between powerful journalists and those in government and corporate power has become too close. Cited Libby trial. Repeats he does not except himself. You get too cozy with your sources. "You take care of me, I'll take care of you." Very dangerous area for journalists. Something happens, you want a good, high, powerful source to talk to you... and you get closer and closer to the source. You can get so close that you become part of the problem. These powerful people use journalists... and they will use them to the full extent possible, until the journalist says woah, that's too far. But journalists also use their sources. That's a given BUT... the second a source begins to believe a reporter can be pulled in and be part of the team, that's too far. And when the reporter begins to feel part of the team, being an insider, the reporter has gone too far. Journalists must rethink their relationship with their sources. Need a wide and deep reservoir because that makes it hard for any source to seal you out. Says the Nixon administration tried to "strangle" Rather and CBS for information. It became obvious... so then you said, okay, we go to Congress, to the Pentagon, we'll go outside. When you get info from the outside and then you call and get told the President is not available, THEN tell them you'll be on the evening news and tell them you'll be talking to someone from the Pentagon saying something not all that flattering.... it might not work the first time, but it will work soon. They'll start taking your calls again. Q: Crisis in investigative journalism, not doing their job of providing checks on power. Not asking the follow up question. A: Do we still believe good journalism is independent? To be ready to ask the tough question, to have the guts to ask? To follow up on the right question? Is it important if the governor or mayor doesn't answer the tough question of the person before me, should we set aside OUR question and say, Mr. Mayor, Mr. Governor, you didn't answer HER question. That used to be fairly common even at Presidential press conferences. Do we still believe the documents, barring serious national security, belong to the people? That the president is not descended from the sun god, but elected by we, the people? At press conferences, AFTER you listen, take notes, etc, THEN you fan out and establish if what they say is going on IS what's going on. Are we just conveyor belts?.... the president said today, thus and such. Journalists try to play it safe. "If I run this... I'm going to pay a price for it... so maybe I'll water it down just a tad." Is our job to be independent... to be investigative? "Investigative reporting" with an independent attitude is an endangered species. One reason ... when is the last time you have seen a one hour documentary that is investigative in nature on any of the "big 6"? It's gone badly out of fashion. Corporatization of news. Larger and larger international conglomerates. News as a part of the business is getting smaller and smaller. Gap between those at the top and those doing news. Also, corporations are larger, more distant from the newsroom, they have legislation and regulation they want eased or stopped, business to do with government... want to own more stations, with more coverage... so they need regulatory relief from the FCC..."I think you get the drift here." He's not saying they are evil. Most are decent. BUT... their mindset is stockholder value and what's good for the corporation as a whole. Very often investigative reporting is by definition going to make someone in power unhappy. If you are the head of one of those giant corporations, someone will come to you and say, you asked me to get a regulation eased, let me tell you, your guys down in the news dept are taking the hide off the people you just asked to do a favor. It's something we all need to think about. I spent my whole career in commercial journalism, and I do think competition overall leads to better journalism, not in every instance.... if you think about what I just said, the REAL competition has narrowed in that some very large corporations now... control maybe 80 percent of the principle means of mass communication, outside the internet. They don't'want more competition, they want LESS competition. I'm committed to competition... but we're seeing less competition. The next time someone says I believe in the capitalist system and the competitive marketplace, amen. 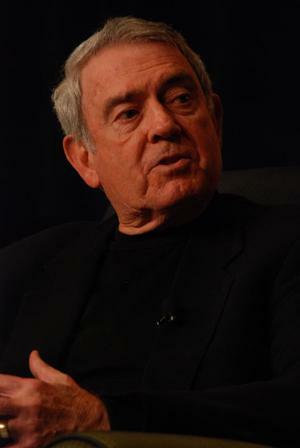 So does Dan Rather. But do we have as much competition as is healthy for us as a people, as a country, as a society? If you believe the press has a very important watchdog role to play... a watchdog isn't an attack dog or a lap dog. An attack dog goes for the throat, a lap dog is a nice dog, but a good watchdog barks at everything that is suspicious. "The role of the journalist is to bark. Not to always do it right, but to always be barking." Q: Savvy PR people can get all the media outlets to talk with one voice. She raises the blogosphere bringing people to the internet for their news. How has this affected journalism? The democratization of news. A: We could talk about this all afternoon. The Internet is a tremdendous tool not just for news but for information and education...illumination. Its potential is unlimited. I have no idea where it's going, but my experience as a reporter tells me that whatever you think it will become in 15 years, it will probably be that in 3-4 years. Some blogs are irresponsible, some are valuable... some actually send out reporters, wearing out shoe leather, yes. There is a tendency to overgeneralize about blogs. He applauds responsible journalism. He does think there is a problem with anonymity and he has no solution. No accountability. Given time, the marketplace will balance this. But sometimes reputations can be ruined, businesses ruined. The ability to be anonymous is a problem for blogs and the Internet as a whole. Q: How does new media have the potential to step forward and do what you did with Nixon? A small group of journalists not asking the appropriate questions. How can new media address that problem? A: Stay on it. Hold people accountable. If you think the right questions are not being asked, a constant putting out, these are the questions that are not being asked, can have an effect. These are major truths that are not being told. We need to move into an era of increased accountability. Basically says if someone in power lies and the facts support that, we should say they were lying, but when was the last time any journalist did that? Q: She asked whether or not journalism took a hit during the Libby trial. He didn't seem to hear this question accurately. A. Talks about the previous understanding when you interviewed someone, it was on the record unless the source said otherwise. Now reporters tell sources, I'll protect you. What are the new rules of the road? How can we get info from sources and keep our integrity? He says we need to start with the presumption that every conversation is on the record. Ideal journalist will always accept that he or she may lose access, may get in trouble with their boss. Jouralism has lost its guts... that's what I'm talking about. Q: Fairness Doctrine going by the wayside created these problems? A: If not created, then been exacerbated. Individual citizens have not been privy to as many truths, facts, as is necessary for us to make collective right decisions, nationally. Politicians and corporations should answer for themselves. I'm a journalist... what is the proper role of journalists in society? There are people who believe that journalists are already too aggressive, too independent. That's obviously the direct opposite of what I believe, but ... they are the people who say, we've spent our lifetime in government and we know better. We need to parcel out the information, and average people can't be expected to understand these things.... "I don't think that's the American way. The American way... is give me the truth, the whole truth, and nothing but the truth, and let me make up my own mind".... that's what journalism is supposed to do. From audience: Independent filmmaker here in Austin. Documentary films. Said that kind of investigative reporting is being done by Brian Ross. A: Agrees. Said in the beginning there are exceptions. But what's important is when someone is going that kind of work, especially with an outlet that has one of the larger audiences, it's very important the people they work with hear from people who support them. He said he knows when people NOT part of an orchestrated campaign write in, it can make a difference. From the audience: If the press won't ask the questions we weant to hear, is there any way a citizen can go to a high level official themselves? Jane said it's very difficult. This president, for instance, doesn't even talk to journalists very often. Rather again seemed not to have heard the question, and complained about the acoustics. Said that knowing you only get one shot with your subject, makes getting the follow up question even tougher. Then he said, to conclude.... he was going to put in a plug for HDTV but he'd skip that. Laughter. He asked Jane if political blogging helps bring us together or pull us apart as a society? She said it offered a way for people to express their viewpoints on all sides of the issue, to have a discourse in a way that doesn't exist any place else, which allows a lot of clarification of opinions and facts. But in terms of bringing us together or driving us apart... blogs get a lot of attention, but she doesn't know they have that kind of influence. Rather then said Archibald MacLeish in the wake of WW2 pointed out that what happens 3000 miles and an ocean away, we tend as Americans to have the illusion it doesn't really happen, but that's a dangerous illision in our increasingly smaller and independent world. TV can make things seem smaller than they really are, contained inside a small box. He feels that improved TV technologies such as HDTV might improve that. But McLeish said we need to stop thinking of ourselves as the center of the whole world or the whole universe. We've reached the point where we are world leaders, we can lead, but we have to lose this illusion that things that happen far away don't matter. Talks about the war... war is real mud, real sand, real screams of the wounded and bones of the dying. If you only read about it on the internet or television... it descends into a kind of video game in your mind, and an "oh well, once again they blew up some people in Baghdad" attitude sets in. Anything that can get us to understand that things are not far away, that what happens on the streets of Baghdad does matter on Main St. He's high on the Internet because it helps to get away from that illusion. Updated with photos by Clint Gilders from club.kingsnake.com.